PuzzleMad: Shane's Viper Bit Me and my Balls are Too Big!!! I bet that title got you reading!!!! Continue right to the end for a full explanation! This week, much to my surprise, having had a few very very bad days at work, I came home to a surprise package! Now that always makes my day but it especially is fun when the name on the postage label tells me it comes from my good friend Shane Hales. I am aware that he has lots of new ideas and plans to produce quite a few new puzzles in 2017 but I wasn't expecting anything quite so soon. I am so SO SO grateful that I have been chosen to be "Agent 001" and pretty much always receive the second puzzle in each line (000 remains in his ownership). Viper is a special puzzle which shows off several things - firstly, as always, it shows off Shane's characteristic craftsmanship skills. He claims never to be up to the standards of Scott Peterson, Eric Fuller or Pelikan and I have to say that there are very few people in the world as good as that. However the drop in finish quality is not due to lack of skill, it's more due to lack of time and different priorities - I know that given time and lack of other distractions, he could produce incredibly accurate work - he has, after all been awarded The Master Carpenter Award by the Institute Of Carpenters (as a fellow of the Institute), The Master of the Worshipful Company of Carpenters, The Master of the Worshipful Company of Joiners & Ceilers, and The City & Guilds of London Institute - very few people achieve this! 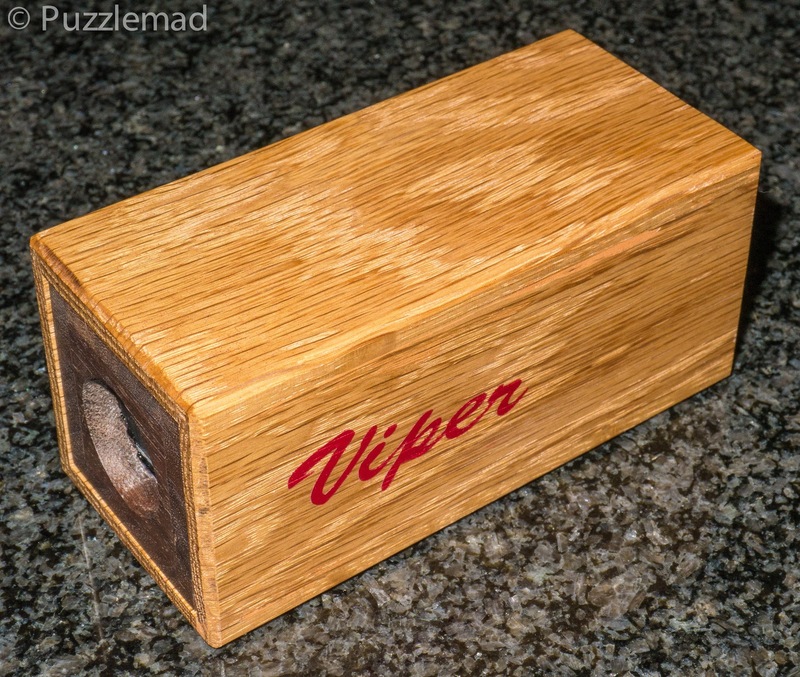 Second, his designs are always very novel and very interesting (Viper is pretty unique as far as I know). They are often very simple in their basic premise but beautifully implemented and well hidden which makes them all the more enjoyable. Finally, the other feature that is totally unique is his sense of humour! There are very few puzzle makers out there who actually make me laugh out loud when I attempt to solve something. This puzzle really did that just like his Haleslock 2 which also had a lovely bit of misdirection which made me laugh after I solved it. 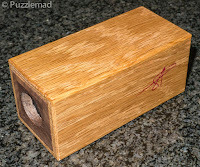 I got the idea for this puzzle from another 80's film, Gremlins. But also if anyone ever bothered to read the notes on "my collection" page that I've attached to each photo (I know at least one person did as I had to make corrections thanks Bernhard!) then on one of them you would notice maybe a strange comment if you have a mind like that!!! (I do like a easter egg if you hadn't noticed?) 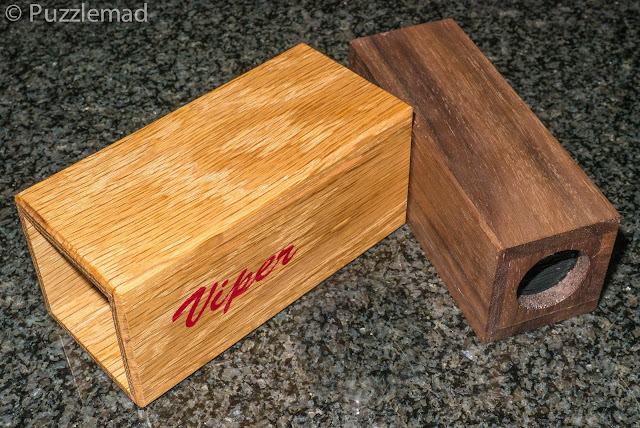 But no, it gave me this idea, so from these "VIPER" was born. 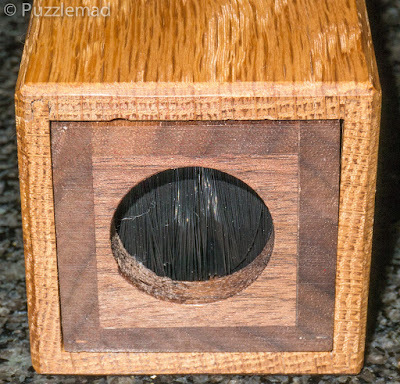 I really like this puzzle, and I hope so do you !! 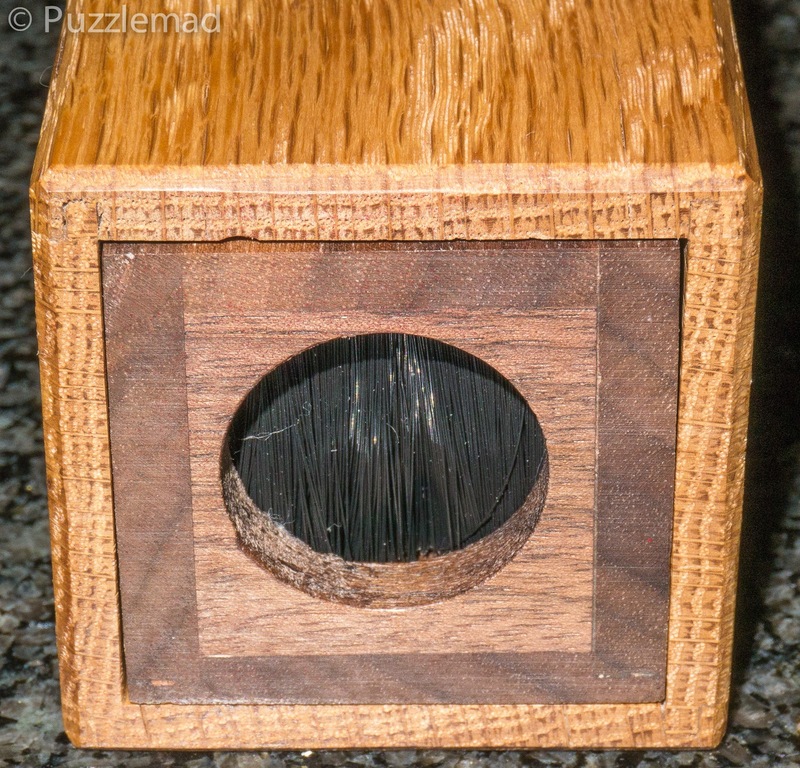 This puzzle can BITE you. 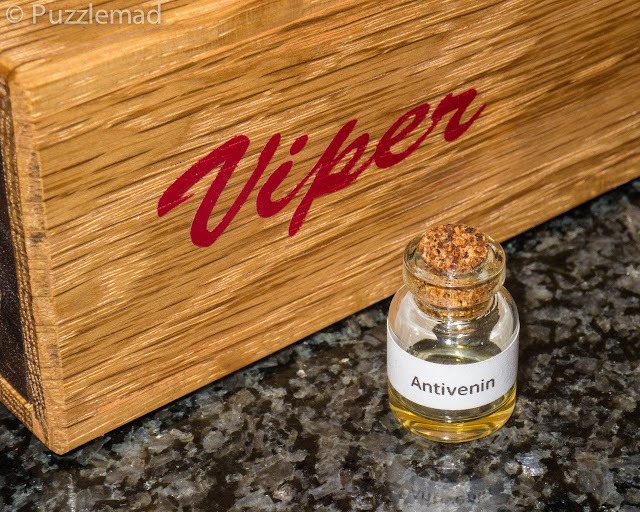 it's not recommended for anyone under the age of 21, anyone with heart problems or a pacemaker, anyone with ophidiophobia, bad nerves, pregnant, or wanting to actually have children full stop. If you are a bag of nerves (a wimp) and you get the offer please turn it down. I have been asked several times how can I get one of your limited edition puzzles? THERE IS ONLY ONE WAY. DIRECTLY FROM ME. IF ANYONE EVER SAYS THEY CAN GET YOU MY PUZZLES THEN THAT IS A LIE. 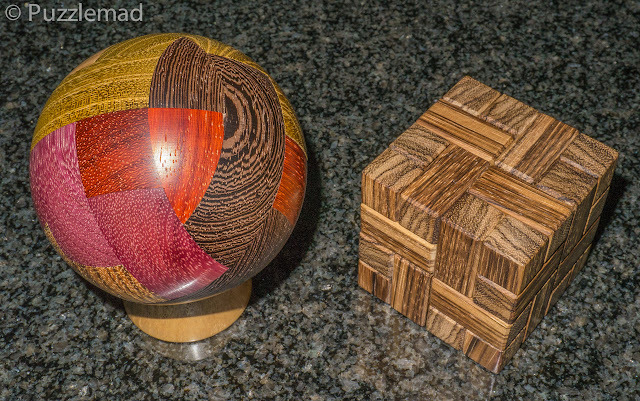 All my limited puzzles are and will always be gifts from me. With the exception of Nick Baxter's auction this year, but you all know why I did this, and I'll probably never do it again unless it's for something special, it will also only ever be auctioned or offered by me. 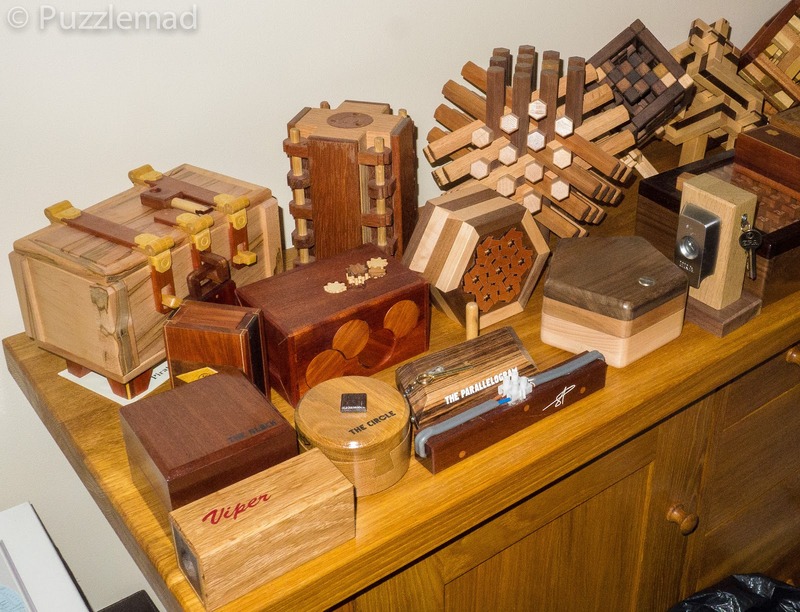 I have strict rules with these gifts for good reason, I spend lots of my free time and cash creating these for you, so, they can never be sold, swapped, even given away. If someone decides they don't want a puzzle anymore, just return it (I'll cover postage) and I'll send onto someone else. That's the RULES. I'm a collector to. There are so many puzzles I want, so I feel everybody's frustration. I'm very sorry and sad about it, but its a hobby. I do it for the joy of doing it only. I don't need pressure, I give that to myself. If I didn't do what I can do then I wouldn't make any, so something is better than nothing, right? I try to get things all over the world, to collectors I know meet others, so my stuff can be shared. 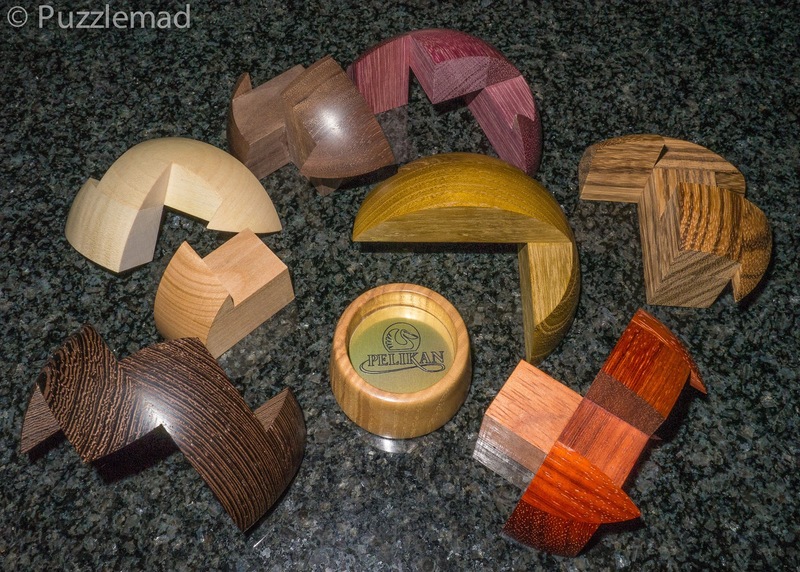 I've had people email me to nominate others (which I LOVE) for a puzzle. I chat with the very top brass of the puzzle community, with some of the founders of our community of today, and also with the newcomers, anyone and everyone. I have even been asked how I could be inspired by them, and in fact this person's inspiration went into The Goblins Door, and I thank them for that. So far I have not receive any pressure or selfishness from our community, and thats why I am proud of being a very small part of it. These are my gifts, because it's my way of giving a little something back to others that give us ALL so much. I will notify the (lucky?) people I have chosen to care for this new puzzle very soon. The other feature that always accompanies Shane's puzzles is spelling and grammar errors and I love him for it! 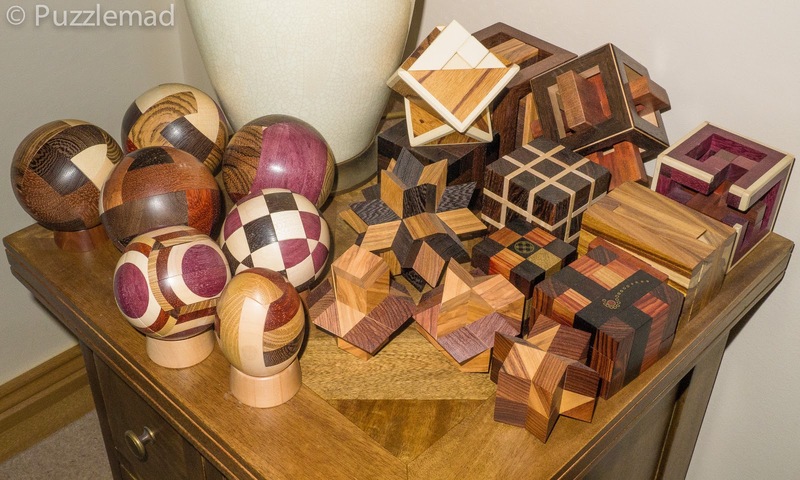 With little schooling, he has worked his way up to the top of a very successful building company and now is one of the most sought after puzzle makers in the world. The letters that come with the puzzles always add a smile to my face for the humour and the errors and Viper is just the same! So the aim is for me to open the box with no force and without peeking inside. He has very carefully put bristles over both the endholes to prevent being able to see inside but the instructions alone are enough to warn me off cheating. No way to see inside! So with some trepidation I put my right index finger in one of the holes and felt around.... there was something in there which I couldn't work out what it was but it was big enough to be awkward and the hole is small enough to make it quite a dexterity puzzle to get it out. Is it a tool? Will it help in any way? Feeling about further revealed some very odd unfamiliar shapes and something that I could move with a bit more dexterity. It took me about 20 minutes to release the "tool" and I immediately had a big giggle! I've hidden the "tool" behind a spoiler button below - don't look at it if you think you might receive a copy of the puzzle - remember Shane has made 10 so some of you will be lucky. It might be a tool but something tells me it won't help open the puzzle. After finding the contents of one side of the box, I went to work on the other side and there are some very odd things inside. I had a good feel about and....THE VIPER BIT ME! OUCH!!!! I pulled my finger out in a hurry! No blood, no punctures, no damage but it certainly made me think twice before putting it back in. I don't own any puzzles by the mad Australian dentist (Stephen Chin) but I know he has done something very similar. Eventually I got my courage back up and tried again. After a few more nibbles and a fair bit of grimacing, I had worked out what was causing it to bite me even if I didn't know how it happened. I then avoided the mouth of the Viper and continued my exploration. There are other things inside there next to the snake and after thinking about it I had my Aha! moment. I think that a further 15 minutes passed and the box slid open. Once I could see inside, I understood how every feature worked and again I had a good laugh out loud - I had not seen that device since I was a child! Very clever, very funny, just the right difficulty level and a perfect Aha! moment. Brilliant! If you are one of the lucky ones who get one then you will love it! It shouldn't leave any permanent scars but will make you pleased when you understand how to avoid the pain! Pride of place on display - Mrs S doesn't seem to mind! Thanks so much mate! I am always flattered that you consider me for your puzzles at all, let alone reserving number 001 for me each time! Yet again you have produced something unique and special and very funny! Mrs S says "my balls take up too much space"!!!! Just look at the precision! 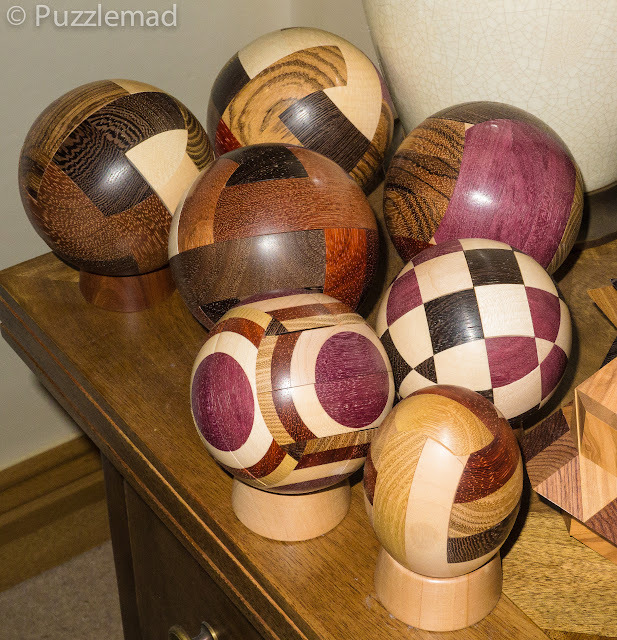 Having solved it, I put it on display in the living room alongside the other turned puzzles from Pelikan and Mrs S is a little unhappy - apparently my "balls take up too much space"! Before I go and see my Urology friend, Steve Canfield about this I might just have to rearrange my display as that is probably a less painful solution to the issue! The lamp table is a bit crowded I guess! Ho ho ho! Sorry about the double entendre! Keep an eye out on the Pelikan site as more gorgeousness is coming soon! Thank you so much mate! I loved it!!!! Kevin, it's my professional advice that you keep your balls well protected. Although they are some very beautiful balls (and I should know) they are fragile and could easily be damaged by an angry spouse with an errant kick. Be careful my friend. Thanks for the advice Steve! I will make moves to ensure that Mrs S is unable to kick my balls - I think that leg shackles might be the answer! You received an electric shock with the viper, right? Mr or Mrs Anonymous, please open your mouth as wide as you can. Place your index finger inside it. Then shut your jaw as hard and as fast as you can on said finger. Let me know how you get on :-) if you need further help after 2 of my agents are doctors. That would break my finger! You have 8 of them and 2 thumbs so there are definitely spares! Plus it's pretty easy to fix a broken finger and hardly hurts (me) at all! Take care if your commenters are anonymous. They love to spout gross and insulting generalisations.